The most vital component of any aircraft is, of course, its fuel system – and it is essential that all parts of this system be in good working order. Knowledge of your aircraft’s fuel system is essential to understand what kind of maintenance needs to be carried out. The primary function of a fuel system is to store fuel and provide a means of delivering fuel to the aircraft’s engine and propulsion system, safely and successfully. Aircraft fuel systems vary in complexity based on the size of the aircraft in question, however, the principles of all aircraft fuel systems are the same. Fuel is stored in a fuel tank which is made from a material, such as aluminum alloy, that is non-reactive to the fuel. 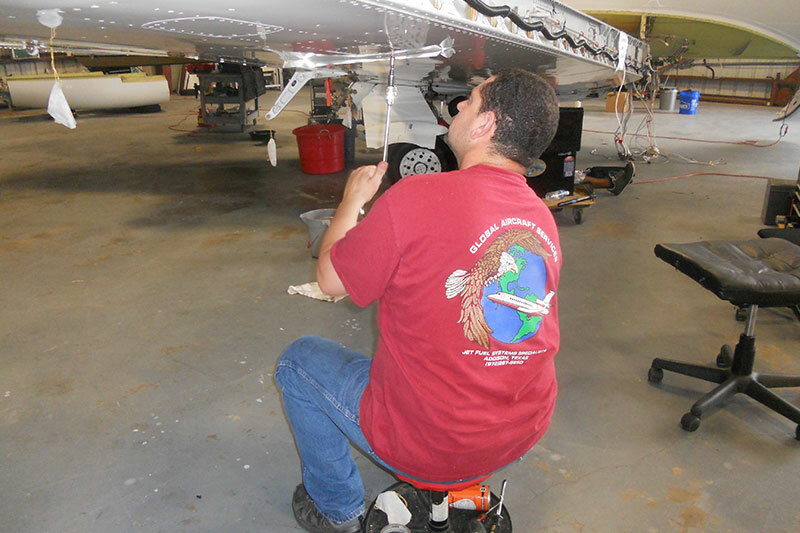 Some aircraft may incorporate fuel bladders as part of the fuel tank, which can be easily removed for repair or replacement. From the fuel tank, fuel is piped through fuel lines (either by gravity or by a pump) to the engine, where the flow of fuel can be managed via a selector valve. This valve is essential as a safety measure to prevent an engine fire from reaching the fuel tank. Some aircraft also have a selector valve that allows fuel to flow from either the right, left or both tanks so that the pilot is able to balance the load of the aircraft. Fuel tanks are vented so that air can displace fuel as it is used, and maintain the balance of the atmospheric pressure inside and outside of the tank, to prevent the fuel tank collapsing and avoid the engine being starved of fuel due to pressure changes. This is the simplest of fuel systems commonly found in high wing aircraft with a fuel tank in each wing. A gravity feed system is designed with the fuel tanks above the engine and propulsion system, with lines feeding the fuel from the tank to the engine via gravity. Gravity feed fuel tanks do not use any pumps and have a simple shut-off valve system, with some aircraft having the option to manage fuel feed from either left wing, right wing or both tanks simultaneously. For low and mid wing aircraft where the fuel tank cannot be located above the engine, a pump feed fuel system is necessary, utilizing one or more pumps to deliver fuel from the tank to the engine. Usually, this type of aircraft fuel system has two pumps arranged in parallel – an electric and an engine driven pump – to provide a backup pump should one fail. As with gravity feed pumps, there is a shut-off valve with selection capabilities. Pump feed aircraft fuel systems can also include fuel injection. In this type of system, an electric pump pressurizes the fuel and removes any air and an engine driven pump delivers the fuel to the engine by spraying it directly into the engine intake or cylinders. This provides a measured, continuous spray for smooth engine operation. In the aviation industry, where mechanical error can have truly devastating consequences, generalized maintenance of aircraft fuel systems is simply not enough. Regular, expert aircraft fuel system maintenance provided by a company such as Global Aircraft Services is extremely important. 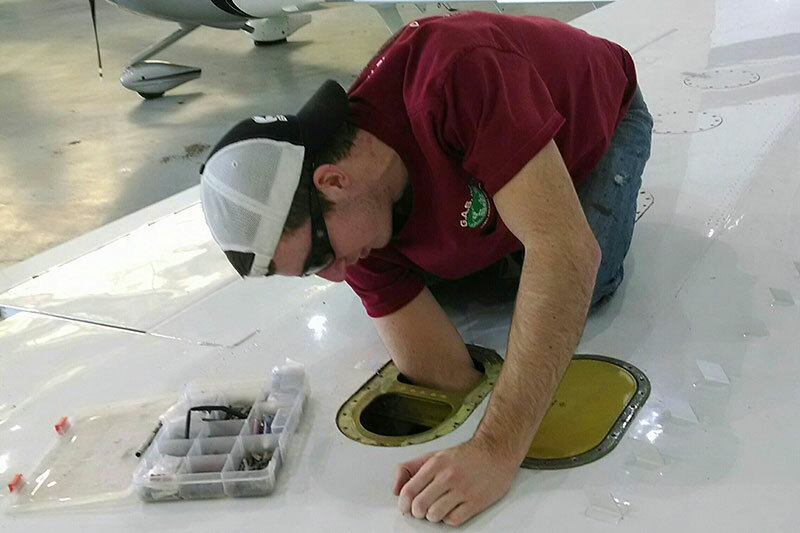 Our team of highly qualified and experienced aircraft technicians provides expert repair and maintenance services for all aircraft fuel systems, with a quick turnaround to prevent downtime of your aircraft. For more information and advice on our professional aircraft fuel system repair services, contact us at Global Aircraft Services today.